Played for St Albans City Youth since under 9 making a club record 341 appearances. Captain of the successful St Albans City Midweek Team who reached the second round proper of the FA Youth Cup on two occasions. Trial at Man Utd cut short at 14 years old through serious leg injury. 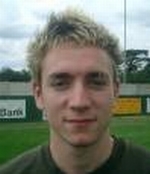 appearance as substitute for the First Team against Kingstonian in 2001. A regular with the reserves and played 66 games before breaking into the first team squad at the end of season 2003-04.
resulting in major brain surgery. Has since made a complete recovery and is back training but is not expecting to play competitively for the rest of this season.